We would like to make our parents and families aware of a new resource designed to provide guidance for families going through separation or divorce – ‘Your Parenting Plan’. First published in 2006, as the Parenting Agreement for Scotland, the Plan has been refreshed by the Scottish Government in conjunction with a number of key agencies, and will be promoted over the coming weeks to help as many families as possible access practical advice. If there is anything we can do to help, do not hesitate to contact us at the school and we can point you in the right direction. all East Renfrewshire schools will be closed tomorrow, Thursday 1 March. Scottish Government advice for tomorrow is now confirmed as ‘do not travel’. Funds raised from Pyjama Day! Please see attached document for information regarding applying for a primary school place for your child. Please note, if he or she is aged five between 1 March 2018 and the end of February 2019 you should go along to your preferred catchment primary school between 1.45pm and 3.30pm, any day during the week of Monday 15 January to Friday 19 January 2018. All Glow users, can get copies of Microsoft Office 2016 to use on their home devices – PC, Mac, phones and tablets. This will enable the use of a range of Microsoft products (Word, Excel, PowerPoint, Access, OneNote etc) on up to 15 home devices without cost (the 15 licences being split as 5 for PCs and/or Macs, 5 for tablets and 5 for phones). To do this, login to Glow using your pupil’ s login. (All children have been issued with a Username and Password. If, however, your child cannot remember their details, please contact the school office and we will pass them on again to the pupil). 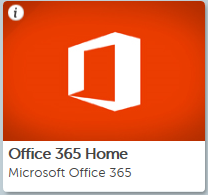 From the launch pad click the Office 365 Home tile (see image) then the “Install Office apps” button and follow the instructions. Note that if downloading to an iPad or iPhone the process is different, the apps should be downloaded from the App Store and then log in using the Glow username. There is more information from Microsoft available here. When logging in, you will be asked to enter your user name and this is your Glow user name plus the domain e.g. gw15examplejames@glow.sch.uk, once you do this, you will be transferred to the usual Glow login screen, when you enter your details here your registration is complete. The Glow username will only activate the software for as long as that account is active in Glow. It is also possible to download the apps from within Microsoft O365 – within O365, click on the Office 365 link in the top left of your screen and from the O365 home page, click on “Install Office 2016”. A quick reminder that the school will close at 2.30pm on Wed 21st Dec. The church service will start at 2pm, therefore, children should be collected from church at 2.30pm as the school will be closed. We’d like to take this opportunity to wish you all a Merry Christmas when it comes! Please remember each class write a learning blog which can be found under the red PUPILS heading on the landing page. Also, look out for the DATES FOR DIARY/LETTERS HOME heading above which logs all letters which have been sent home. Please find details of after school clubs available to the children at Uplawmoor Primary School. Through this short survey Scottish Government would like you to help them find out what matters to parents about their school and their child’s education, focusing on what needs to be done to make the improvements we all want to see. The survey will close on October 16th and will inform the annual report for the National Improvement Framework parental involvement driver. The annual family Hallowe’en Disco will take place on Saturday 28th October between 7.30pm and 10pm in the Mure Hall this year. The event has to be limited to 120 people which includes infants. Tickets are £10 per adult and £5 per child (including infants). For further info contact Lynn Condy, Jennifer Green or Alison McKenzie. For tickets please complete letter/slip which was sent home week beginning Monday 11th September. We will be doing the Live Primary school HIIT each day this week with the Bodycoach so remember your PE kits each day! Monday’s HIIT was a great success and a huge well done to our Primary 1s who worked particularly hard during their first HIIT! The Primary 4/5 are using their maths skills to work out their ‘resting heart-rate’ and Primary 6/7 calculated their ‘fat burning rate’ to work out how many times their heart beats to be in the range for gaining fitness and strength. Here are our House Captains for 2017-2018 (as voted for by the pupils of Uplawmoor). The pupils have settled into their new classes and are busy starting their new programmes of work. We are looking forward to welcoming all of our wonderful pupils back to school tomorrow. Primary 1 parents are welcome to accompany their child into class. (Informal entry is 8.55am). Early to bed tonight everyone! We are looking forward to our Celebration of Achievements at the church today at 12-1pm. On behalf of Mrs McKay and all the staff at Uplawmoor, we wish the pupils and families a wonderful summer! We will see you all on Wednesday 16th August at 9am! The pupils worked in their houses today to build an outdoor den using resources given to them and materials they could find outside. The annual Staff v P7s netball took place today. It was probably our toughest match to date, but the teachers retained their title. Well done P7, you made us sweat!